A brief diversion from normal service on this blog for a gratuitous advertisement: today is publication day for my book The Matter of the Heart, the culmination of two years’ work. As well as spending innumerable hours in libraries reading medical papers, I had the great privilege of talking to cardiac specialists and even watching them as they performed open-heart procedures, bypass operations and transcatheter device implantations. Much of it did not feel remotely like work. 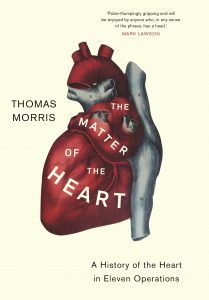 The Matter of the Heart is now available to buy at Waterstones, Amazon, Blackwells, and your friendly local bookshop. The commercial break is now at an end. Normal blogging activity will be resumed tomorrow. Congratulations, Tom! I am so proud to be your aunt! Looking forward to getting your book over here. Much love.